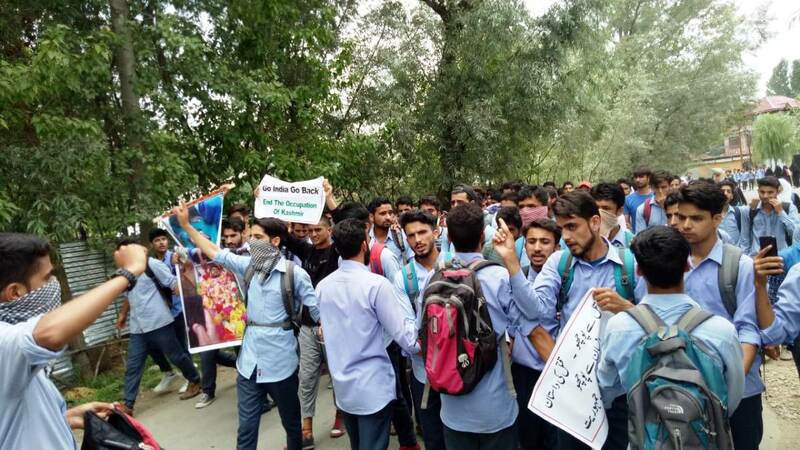 The students of Government degree college Kupwara on Tuesday staged a massive protest demonstration against the killing of a youth by an army in Trehgam town of north Kashmir’s Kupwara district last week. GDC Kupwara students take out a protest march. The students, including girls, gathered at the campus and raised anti-India and pro-freedom slogans, students took out the protest march holding placards in their hands that read: “Stop Innocent Killings” and “We Want Freedom”. On Wednesday evening, a local youth Khalid Ahmad Malik of Bun Pora Trehgam was shot dead by the army when some youths pelted stones on a patrol party. When last reports came protests were going on.